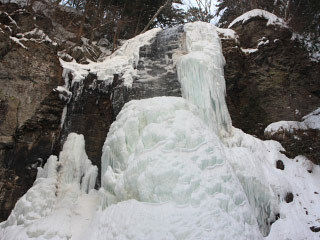 Kiyotaki Falls in Winter (冬の清滝) is very beautiful because it will be frozen up compeletely. It is about 30 tall waterfalls located southern side of Mt. Ontake. It is very popular waterfalls for Takigyo. Many Syugensya will visit and practice at this falls. There is a parking and restroom. 1. 1. use local bust to Kiyotaki. Kiyotaki Falls is one of the main feature of Otaki, Nagano prefecture. It is located in southern side of Mt. Ontake. It's about 30m tall waterfalls and frozen up in winter. Kiyotaki is very sacred waterfalls for Takigyo. Many Syugenja practice at this waterfalls.